The Moor and the Loch was a tremendously popular work in its day and had gone to six editions by 1884, by which time it had been considerably enlarged and amended by its author. 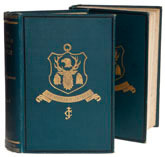 Other than the usual low quality print-on-demand Internet knock-offs, it has not been reprinted since the nineteenth century, largely because so many original copies remain in circulation that even second editions are pretty cheap (in some cases the prices of these actually undercut the print-on-demand versions). Colquhoun certainly deserved to be widely appreciated, because he wrote with an irrepressible style and really was an expert; he described himself as a sporting naturalist, which, broadly translated, meant that if a thing interested him enough he shot it and had it stuffed. No-one saw anything wrong with this approach and people bought the book because it told them almost everything they needed to know about killing things in the wilds of Scotland, at a time when public curiosity about the subject was building up to insatiable levels. The first volume is entirely taken up with stalking and walked-up shooting, Colquhoun making no secret of his contempt for driven shooting, which was becoming popular at the time. In itself this makes the book remarkable, as the vast majority of nineteenth century shooting books are about driven game, whereas Colquhoun wrote with first-hand experience of shooting partridge, grouse and black-game over pointers, not to mention hares, seals, ducks, kites, hawks, pigeons, crossbills, foxes, wild cats, sea birds and wild goats. The better specimens ended up in his private collection and although he very occasionally let slip the odd remark in the later editions about how he might have played a hand in making some rare species even scarcer, he was very much a creature of the time before conservation. Despite the title, fishing only makes it into the second half of the second volume, but given the size of the book, that still means nearly 200 pages on salmon, trout and sea loch fishing, in a book that is full of stories, but relatively short on instruction. Colquhoun came from an era that laid little emphasis on flies, so there aren’t any lists of patterns and few details that can’t be found in other books, but as a tale of a way of life and a style of fishing that would have been largely swept away by the late nineteenth century, it is a valuable work.